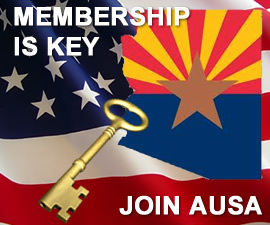 Providing support to Arizona members and their families! 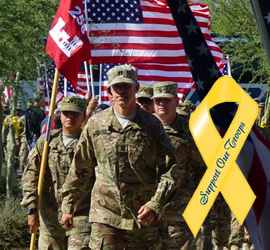 We are the Arizona Territorial Chapter 7202 of the Association of the United States Army (AUSA). As Membership is the Key to success, we strive to increase our Corporate and Individual membership and ensure that our members are well served by and informed about our Chapter activities. To ensure we are able to support our service programs we host social events, an annual Golf Tournament, and various other fundraisers through the year. To foster involvement and camaraderie within our organization we hold monthly meetings and host a minimum of three general membership meetings annually. 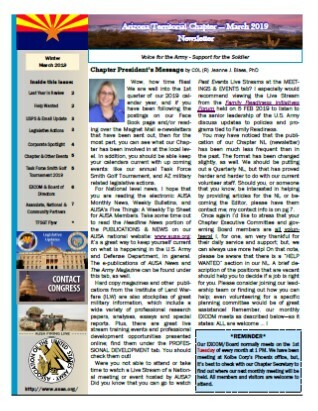 If you are not already a member, find the membership link on this page and help our Chapter and AUSA remain a strong! What have you done for our Troops today?